This portrait of Hannibal Hamlin was recently donated to the Bangor Historical Society. The society estimates the painting is from the early 1830s, but does not yet know the artist was who painted the portrait of Hamlin. Matt Bishop, curator at the Bangor Historical Society, has accepted lots of interesting donations at the society’s Thomas Hill House over the years. A box of Bangor-labeled matchbooks from the late 1800s. An old-fashioned knife to cut shingles found at the bottom of the Kenduskeag Stream. A Victorian-era silver tea strainer fished out of someone’s pocket one afternoon. The donation the historical society received in October, however, takes the cake: one of the earliest known portraits of Hannibal Hamlin, vice president of the United States under Abraham Lincoln during his first term and one of the most famous residents of Bangor. “We get donations all the time, but something like this is a real gift,” said Bishop, who has handled the society’s collections for the past four years. 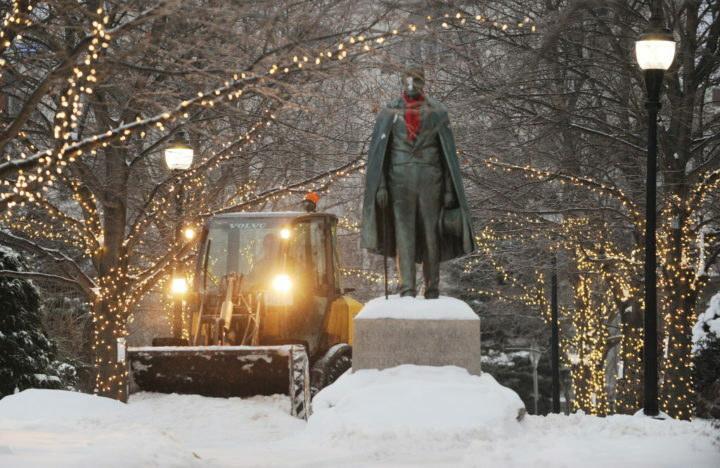 Bangor Public Works employee Bud Green operates snow removal equipment near the Hannibal Hamlin statue in downtown Bangor on Sunday morning in this Dec. 22, 2013, file photo. 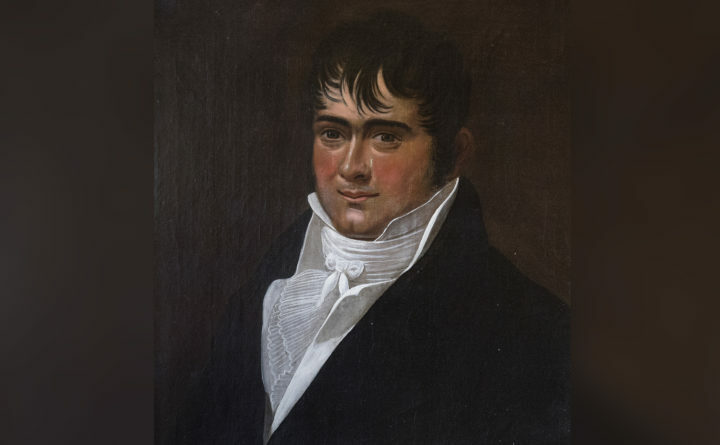 The portrait, painted by an as yet unknown artist, shows what is believed to be Hamlin in his mid-20s, not long after he passed the Maine bar in 1833, but likely before he was first elected to the Maine House of Representatives in 1835. It is a different look for Hamlin, compared to the one folks are likely most familiar with — the statue of Hamlin that stands in Norumbega Parkway in downtown Bangor, between State and Central streets. Other than the general age of the painting, not much else is known about it. 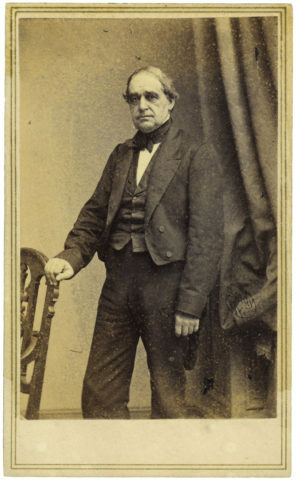 It was gifted to the Bangor Historical Society by an anonymous donor with ties to the Livermore family of Paris, the Oxford County town where Hamlin was born in 1809. Hamlin’s mother was Anna Livermore, a descendent of Elijah Livermore, for whom the towns of Livermore and Livermore Falls were named. Technically, the gift was made last September, but the historical society spent the better part of a year doing research into the painting’s provenance: its age, its condition and whatever chain of ownership can be traced through the decades. Maine State Archives Although first in succession to President Abraham Lincoln, Vice President Hannibal Hamlin spent much time in Maine during the Civil War. He belonged to Co. A, Maine Coast Guards, a militia unit called up in early July 1864 to garrison Fort McClary in Kittery. A private, Hamlin pulled guard duty and served as a company cook for three months. Hamlin, who moved to Hampden in the mid-1830s and to Bangor in 1848, rose to prominence in the 1850s as a U.S. senator from Maine who was ardently opposed to slavery, a stance that later helped position him to be selected by Abraham Lincoln as his running mate in 1860. In 1864 he was replaced as vice president by Andrew Johnson, who was thought to be a better choice for the job in the waning years of the Civil War. Johnson, who became president upon Lincoln’s assassination, eventually was impeached, and is now regarded by historians as one of the worst presidents in U.S. history. Risteen Bahr, chair of the Bangor Historical Society board of directors, said the painting shows Hamlin at a time when not much is known about the details of his life. The identity of the painter remains a mystery, though Bishop feels confident in saying that it was not painted by Jeremiah Pearson Hardy, a famed Bangor artist who painted portraits of many 18th-century Bangor area luminaries. If funding can be secured, Bishop hopes to have a Morellian analysis done on the painting, a detailed look at minute aspects of paintings such as brushstrokes, ways of painting facial features and other idiosyncrasies specific to a given artist. Even that might not find the identity of the artist or the exact year it was painted — or where, or why, or any of the other still unanswered questions. Bishop isn’t even 100 percent sure that it is actually Hannibal Hamlin in the painting, though he is as close to certain as he can be. The portrait of a young Hannibal Hamlin is on display at the Thomas Hill House on Union Street, where it will hang in the Hamlin Room for the foreseeable future. The Hill House is open from 10 a.m. to 4 p.m. Tuesdays and Thursdays, and by appointment.